Surround sound systems are pretty cool, but there are two main problems with them. First of all, they’re huge and require a large amount of dedicated floor space. Secondly, they’re so expensive! Instead, why not opt for a soundbar? They offer a significant increase in audio quality versus stock TV speakers, and there’s one for every price range. To help you out we’ve rounded up some of the best budget soundbars on the market. This article should allow you to find a product that you like so that you can upgrade your old speakers and not break the bank doing so. You decide if you want to call it a sound bar or soundbar – they’re the same thing. In the table below, you’ll find the name of every product we’ll be reviewing, as well as a couple of important pieces of information about each of them. There’s far more to be said about these sound bars, though, so don’t rush into a decision just yet. Now that you’ve had a quick look at our most highly recommended products, let’s examine each of them in turn. We’ll be looking for the good things about them, the great things, and the things which could use a little work. Without further ado, let’s begin with the least expensive product, the ELEGIANT USB Powered Sound bar. 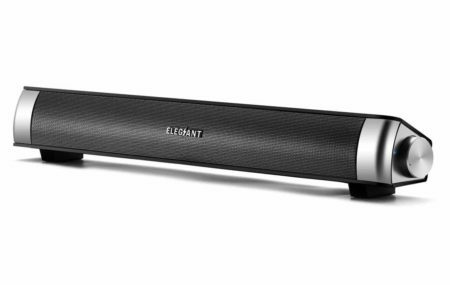 Starting at the lower end of the price spectrum, we have the ELEGIANT USB powered sound bar. First things first: this is a really inexpensive model (it retails for around $30), so it’s not going to be suitable for plugging into your TV. It’s designed with PCs in mind, and as such, far less power is needed, given that you’ll rarely be more than a foot or so away from it. That said, it does have enough oomph for general media consumption. It has two 3W speakers, one on either side of the device. At such a short range, this simulates surround sound, but it’s obviously nowhere near the real thing in terms of quality. These speakers have a surprisingly strong sound profile: the bass is certainly respectable, and the treble is crisp and clear. There is some distortion when you turn the volume up, but at these levels, listening would become uncomfortable before you noticed it. On the right-hand side of the unit, there’s a volume dial. Turning it all the way down powers the sound bar off, and there’s a blue light which shines when the power is on. If this becomes a distraction, you can always cover it with tape or something, so it’s not even an issue. This sound bar relies on a USB port to supply it with power. You can plug it right into the back of your computer, which is usually where the primary microphone and speaker jacks are anyway. You can, of course, plug it straight into a USB wall charger and connect your phone or tablet via auxiliary cord if you’d like to. There’s no HDMI port on the back, so it’s not ideal for connecting to a TV, although it’s possible if it has a headphones jack and a USB port. The only real issue we came across with this product is the length of its cables. They’re only around three feet long, so if your desk is off to the side of your PC, you could run into a little trouble. For most people, this won’t be a problem, but the last thing you’re going to want to do is to rearrange your desk just to use something you’ve bought. It is technically possible to extend this reach, but that requires buying additional cables, and while these are very cheap, it’s still a nuisance that could have been avoided. On the plus side, the unit looks great. It has a black and silver color scheme, and it’s angled slightly upwards to aim at your ears. This ensures that you get the best experience possible by default and don’t have to prop it up with whatever you have to hand. All things considered, this is a pretty decent low-cost sound bar. It’s visually appealing, reasonably powerful, and simple enough to use. Movie aficionados will likely want something a bit more powerful, but if you just want to listen to music at your desk, this will get the job done admirably. This sound bar from ELlight is another 15.7” wide, USB powered model, but it has a little more functionality than the product we just saw. Accordingly, it has a slightly higher price tag and sells for close to $40. At this price, it’s still not all that expensive, and believe us, it’s worth it. With this sound bar, you aren’t tethered to your desk. You can still connect it to your PC via USB, sure, but it can also connect directly to your devices using Bluetooth, which gives you up to ten feet of freedom. Further reinforcing this point, it comes with an internal battery. This battery offers a completely wireless solution for up to six hours, after which this product can be recharged using the included USB to micro USB cable. To fully recharge, it should only take between three and four hours. 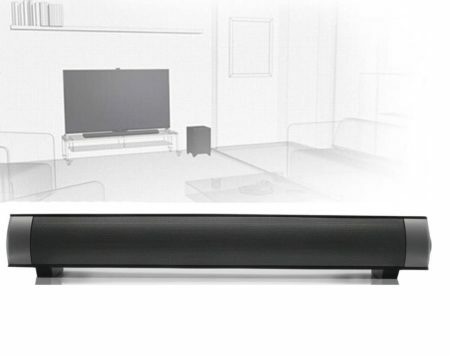 One fact about this sound bar that we can’t hide: it’s a pretty plain looking product. However, black is classic and goes well with anything, so it should blend in nicely with just about any surroundings. If you don’t like it, though, there’s also the choice of a silver one which doesn’t cost any extra. Again, it’s slightly tilted upwards to provide you with the best listening experience available. On the back, there’s the micro USB charging port, a microSD card slot (which makes this the perfect soundbar for taking with you on the go), a 3.5mm auxiliary jack, and a few media playback buttons. These allow you to play, pause, or skip the current track, and whilst they’re pretty useful, they’re also very clicky and feel a little cheap. The unit as a whole is very light too at just 1.3 pounds – there’s a chance it might not survive a fall off of the desk. This unit is considerably more powerful than the last one we saw, though. It has two 5W speakers, which guarantees that you’ll always be able to produce a loud enough sound, regardless of the situation. The bass isn’t fantastic, and can sometimes be a little underwhelming, but the sound is always fairly balanced and never tinny. It does have a tendency to drown out the vocals when turned up really high, so for best results, keep it at a low to medium volume. Essentially, what this product lacks in fancy functionality, it makes up for in versatility. If you want to use it at your desk all the time, that’s fine. If you’d rather take it outside and play music in the park, that’s cool too. It’s nothing to write home about aesthetically, but thanks to its dual 5W speakers, it blows its competition out of the water as far as sheer power is concerned. All things considered, this product would be perfectly suited to someone who moves around a lot: the inclusion of a microSD card slot was a nice touch, and it’s nice to be able to get out of the office from time to time. A lot of people think that in order to find a decent product, you have to spend a lot of money. The VIZIO SB2920-C6 proves them wrong though: it costs something in the region of $90 and can handle just about anything you might throw at it. Unlike the others thus far, it’s a soundbar which is designed for use alongside your television set. It measures 29” wide and weighs 4.5 pounds. Don’t worry if you don’t have enough space for it – it can be mounted to the wall using the included brackets. It’s a fairly boring model to look at, we’ll admit. It’s almost monolithic, black with a silver plastic panel at either end. This does mean, however, that it doesn’t detract attention from the action onscreen, and fits in nicely regardless of your décor. It has two speakers. Whilst VIZIO aren’t big fans of providing further details, we can attest that they are pretty powerful. The volume goes way higher than you’d ever need it to (VIZIO claim that it’ll go as loud as 95dB), and the sound profile is pretty great too. It doesn’t have a dedicated subwoofer, but even so, the bass is deep and satisfying, the treble clear and bright. If either of these isn’t quite to your liking, you can choose to tone them down or boost them a little bit too, which is great. One thing that this soundbar isn’t short on is options. Let’s consider your TV: you can connect this unit whether it has an HDMI or optical port, or even if it uses the old style AV input cables. Sick of watching TV? No problem, just connect your phone via Bluetooth and listen to music in style. What if you really want some extra power to experience your audio in the best way possible? Well, in that case, you can choose to output sound from both your TV’s speakers and this sound bar – your neighbors will probably hate you, but at least you won’t be able to hear them. Ah, but what if you’re all the way across the room? Just pick up the remote control and operate it that way. The remote allows you to play, pause, skip tracks, change the volume, change the bass and treble, and power the unit on or off. It should be noted, though, that this product won’t respond to your TV remote – you need to use the one specifically made for this sound bar. This product is perfect for people who value convenience above all else. It’s incredibly versatile – the combination of Bluetooth connectivity, an array of different output options, and a remote control make it a snap to operate regardless of where you are in the room or what you’d like to use it for. If your budget is pretty tight but you don’t trust any of the lower priced products, take our word for it – this one is worth every cent. All of the other products we’ve seen so far on this list have had one thing in common: they’re all fairly boring to look at. The TaoTronics TT-SK15XUS attempts to address this issue by adding a silver stripe down the middle which also acts as a touch-sensitive control panel which can adjust the volume of the bar. This product is priced in the region of $90, but considering that it’s 34” wide, that’s actually pretty good. The front is covered with a mesh, and the sides are made of matte black plastic. The TaoTronics logo contrasts nicely in the bottom right-hand corner – we’re pleased that it’s not too obnoxious and fairly small. It’s a nice, large soundb ar with a low profile, so it looks great whether it’s located above or below your TV, so you might want to experiment with positioning until you find one you like best. It comes with four 10W speakers which are located at different points in the unit. This helps it simulate a surround sound environment, and in a small space, it actually works fairly well. Despite the lack of a subwoofer, there’s a good amount of bass here, but it never feels overbearing: the other frequencies are all present and correct, making this a great choice for both movies and music. This soundbar has all of the connections that you’re ever likely to need. You can connect it wirelessly using Bluetooth, or plug in your smaller devices with an auxiliary cable. If you’d like to connect it to your TV, there are options there too: you can use an optical, coaxial, or RCA cable, based on what connectors your TV has. If you’re looking for an inexpensive sound bar, there’s a good chance that you don’t have as big a house as you’d like, which means that space is a valuable commodity. To help save space, you can attach this sound bar to the wall directly using the mounting brackets provided. Make sure to mount it properly though – at four pounds, you wouldn’t want this crashing down onto your television. You don’t have to worry about getting up to change the settings either; it comes with its own remote control. Ah, but what if you lose it? You’ll probably have to buy an expensive, model specific replacement, right? Wrong – the good news is that this can also be controlled by a standard universal remote. These are usually available for under $5 and will control your TV too. 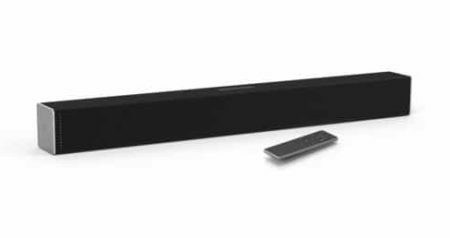 If you’re looking for a soundbar which is large enough to provide a strong audio output but are hesitant to spend a lot of money on a high-end one, there are few which better suit your needs than this one. It’s too large to be easily portable, but that’s not really what it’s intended for – instead, just put on your favorite movie, kick back on the couch and let it blow you away. Note: We’ve replaced this sound bar with a newer model. Click on the link above to purchase the newer Samsung HW-M360. If the other products thus far have been underwhelming to you, the Samsung HW-KM36 aims to change your mind. It’s a little more expensive than the others though, at around $125. To help justify this product’s higher price point, it comes with a variety of new functionality. The most noticeable of these is the subwoofer: it’s a 60W sub, and best of all, it’s completely wireless, connecting to the soundbar via Bluetooth. The bar itself contains two 35W speakers, and as a whole, the unit produces good, solid sound. The bass roars, the higher frequencies ring out warm and clear, and there’s a real sense of depth to its output when the surround sound mode is turned on. It turns out that Samsung is a big name in technology for a good reason. We really like that this is a fairly large sound bar. It would have been disappointing if, for such a high price, it was any smaller than it is. That said, at 35.8”, it might be a little small if you have a very large TV – not in terms of audio output, but aesthetically speaking. The front of the unit is covered with a mesh, and the sides are metal with a brushed effect. The subwoofer is a decent size – large enough to provide a strong and thumping bass, but small enough to be discreetly positioned in the corner of the room if you choose to. Don’t get us wrong, this isn’t a product which will satisfy audio enthusiasts. These people often pay a lot more money for their hardware, though, and for under $150, this is probably about as good as you can get. If you’re more interested in movies than megahertz, it’s good enough for you. The only real issue we noticed was that at higher volumes, the sound tends to become a little muddled. This is only an issue if you like to listen loud, but to be fair, at these levels it’s more likely you’ll get a noise complaint then be dissatisfied. As far as connectivity goes, this product is pretty good. It has your standard auxiliary jack, as well as an optical input, HDMI, and a USB port so that you can connect a flash drive to it if you’d like. There’s also the aforementioned Bluetooth connectivity. It does come with its own remote control, and you can set up your TV’s remote to control this product directly. On top of this, you can control the sound bar remotely using the Samsung Audio Remote app for iOS and Android. 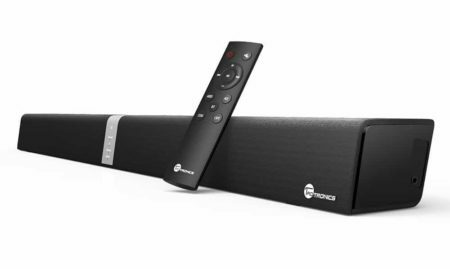 This is a pretty versatile soundbar. It’s large enough to provide ample output for just about any occasion, and it’s nice to look at too. The numerous connectivity options make it an invaluable tool for anybody with several different input devices that they’d like to connect – Samsung has done really well to create such a well-rounded product with such a low price tag. A lot of people are intimidated by audio systems for some reason. Once you know what to look for, they’re relatively easy to compare, and we’re going to show you exactly how to find a product that suits your needs to a tee. We’ve created a guide to some of the biggest things to look out for, so follow our advice and you’ll be the proud owner of one of the best budget soundbars in no time. Before you do anything else, you should consider the size of your home. A smaller room requires less powerful speakers, after all. Conversely, if you have a very large room, you’ll want more power in order to be able to hear your audio clearly from the far side. 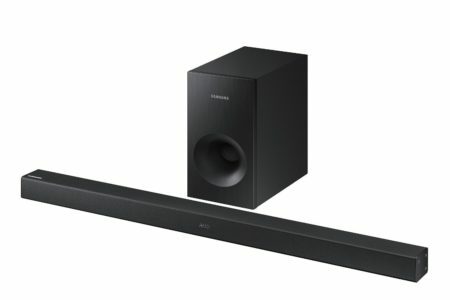 How do you plan to use the soundbar? If it’s just a replacement for your computer speakers, size is less important. In this case, we’d recommend a soundbar with at least two speakers – most of the time you’ll be less than a foot away, and you’ll have to find a product which strikes a balance between being too quiet and knocking your chair backward when it’s turned on. Most sound bars will have their speaker power displayed in watts – as a general rule, more watts means a more powerful sound. This is a very loose generalization, though: for more detailed information on what the specs mean, there’s a great little guide here. If you have a large TV, a smaller sound bar might look a little silly. That said, if the room is fairly small, it shouldn’t matter too much. If you don’t have too much room to spare, you might want to consider buying a product which is wall-mountable. This not only saves you space, it looks great too. How exactly do you plan to use this product? Is it strictly for watching TV and movies with, or are you interested in connecting other devices to it? If so, your best bet is to find one which supports the pairing of Bluetooth devices. This is a nice and easy way to quickly get your music playing without having to mess around with auxiliary cables (although most sound bars allow this too). Remote controls are another issue you’ll have to address. Some sound bars require a specific remote control, some are just fine with being controlled using your standard TV remote, some need an app on your phone, and so on. How do you like your music to sound? Most low-budget sound bars will have a pretty balanced sound profile – that is, not too heavy at either end of the spectrum. Some come with a subwoofer, some don’t. Some allow you to connect one, some don’t. If the bass is something you’re interested in, definitely try to find a product that includes one of these. It’s not only a great addition to have, but it prolongs the amount of time before you’ll outgrow the product too. Nobody wants to spend a fortune on their audio setup, and the products we’ve covered today prove that you don’t have to. Whilst they’re all strong choices in their own right, we believe that the best overall is the Samsung HW-KM36. Sure, it’s a little on the short side, but it costs less than $130 and allows you to connect just about anything you can dream of. It has a pleasant audio profile – good bass, solid treble, and warm tones. If your can allow your budget to stretch a bit above $100, you really can’t go wrong with this sound bar.